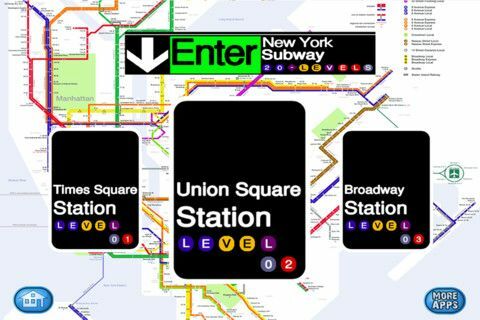 A new and absolutely amazing puzzle game has been released for the iPhone, Subway Exits, an amazing puzzler where you have to complete each of the levels by finding the hidden trigger to move to the next level. It is a truly original take to the escape the room genre and this game will certainly make it big very soon. So I have decided to create and share with you a Subway Exits walkthrough which can be read below. As the app is still very fresh, at the moment of writing I didn’t manage to complete all the levels (they are divided in multiple stations), but I am sure that together we can make it and complete the walkthrough for Subway Exits. Tap any of the red buttons and have it turn green. When the gate opens, tap the “go” button to proceed to the next level. Move the Wet Floor sign to the side to reveal a key. Take the key and use it on the lock, then tap the door to open and proceed to the next level. Draw one of the glass doors to the right or, respectively, left. The Go button appears. Swipe the screen over the yellow blocking lines to remove them. When all are removed, a pass will fall. Get it and use it on the door. Tilt the device until the pass touches the red line. Drag the item that is at the base of the ball, then tilt the phone towards you so that the ball disappears. Press the Go button. As you can see, we could really use your help with all the levels – it would certainly help a lot our readers too, so please contribute to this walkthrough by sharing with us the solutions in the comment section below. Thanks! Previous articleWii U Release Date and Price Leaked – Details Here!